She strolled around the town square watching the little girl’s blond curls bounce to her childishly gracious steps. The girl, in her pretty pink dress, looked four-year-old tops, even though she was actually six, almost seven, soon to start school, and was a frail kid by her own fault. Well, everyone’s, actually. She was much more polite than you would expect, and more cheerful than she seemed too, judging from her reserved, introverted manners. She has never spoken, not even to her mother, not even a peep. As a baby, her cry was faint. As she was growing up, she never tried to talk and only pointed at what she wanted. Doctors could never put their finger on it, merely saying she was neither deaf nor dumb. She’d just rather not talk. And in light of that fact, a shrink would be even more embarrassing. Her mother figured that out when the child started writing all by herself, perhaps learning from the computer, she wasn’t really sure how. But the meager exchange the girl had with her to date has been in writing―words curiously written as if on a mirror, every letter symmetrically turned around. Her questions were too existential for a kid. The first thing she had asked, just short of her fourth birthday, had been who her father was. Her mother made herself show her child the only photograph she had of him. After that, when she was five, the girl asked if she could learn how to play the piano. Not much else. She didn’t talk at school either, and she was now almost seven. She had a pretty handwriting, after all that was her mean of communication. She was fond of some things on the computer and also of the internet, which reminded her of her parents’ minds―perhaps in a more intellectual way than both, given her age and behavior. She won over everyone she crossed paths with, both by her angel-like manner and her eccentricity in walking around in little frocks and ribbons and mary-janes, when today’s children always wear parkas, jeans and modern kid’s outfits. She was like a pretty doll. She wasn't meant to be born, for she would have been an unhappy child. But for some twist of fate she came to life after only five months of gestation. She breathed in and out, resisting death. Her premature delivery had been due to her mom’s twelfth attempt to get rid of her. What kind of life could she give to that girl? She was a 9-to-5 working undergraduate, who’d get cut off by her family when they found out about the baby. And it seemed the life she was seeking for herself came from that life that had expired and left behind a rather plentiful existence for them both. In the span of a few days, there came about the ominous death of their benefactor. He wasn't a bad person, but their independence from him came at a good time. If it weren't for that, she wouldn’t have graduated and become a successful professional with a nice house and the ability to tend to her child’s every need. Instead, she’d have to work like a horse to barely make ends meet for that life she had been unable to extinguish. Now that she could see the girl in all her vividness and beauty, now that, after all, everything had worked out, she thought it was a good thing that she had failed to liquidate her, but it had been a stroke of luck. Yet, she couldn’t say she felt all right with that sort of empty ¬family… The girl was polite, but her quietness should have a reason to be, since she did know her words, and very well. Under that pleasant afternoon sun, on the lively square, the mother thought she had seen, among so many people, a face she used to know. She shook away that thought. He could be anywhere else in the world: Europe, Japan... She never imagined he would someday want to go back to that God-forsaken place she still called home. But in fact she was looking at that very same face. And she noticed that her girl had seen him too, even before she herself had spotted him. The child knew it even before she was sure it was him. She had to chase after the girl, who was running faster and faster with her stubby little legs and her tip-tapping mary-janes. The mother had to give it up when her daughter got so close to him that a case of mistaken identity was no longer possible. But even more interesting was the fact that the girl recognized the teenage face she had only seen once on a photograph as the grown man wearing nice clothes, not that same old band or cartoon shirt and jeans. The mother herself, in her velvet pants, satin shirts and varnished heels, missed that teenage boy sometimes. At the same time, he stepped closer and called her. “Silvia... Don’t you know me anymore?” he asked, touching her free shoulder and holding the reaching hand of the girl. “I never knew you...” she said coldly, trying to get away without success, feeling the weight of the child that was now holding on to his neck. The girl let him hold her. He could not understand why someone like that woman―whom he had met back then and didn't know how to act around kids―was holding a child in her arms. He found it odd that she wasn’t wearing a ring, something really dear to her back then. The little girl took off his glasses as carefully as her little hands allowed her to, and stared closer into his deep blue eyes―eyes like hers, in the same lively blue shade. Nothing had changed. “Same eyes, those honest eyes, someone you’re not supposed to trust, but you can’t help it...” The girl said, repeating what her mother had told her the very first day she had opened her eyes, which was the only thing that child had ever heard about her father, even though she had no way of knowing it back then. And even though the girl had never said a thing in her life, she had a good pronunciation, a slow and steady speech, as if she were reciting it. She was saying something she had never said before: Words. “What’s your name, pretty girl?” he gently asks the child without expecting any help from the mother, for the look on her face clearly showed it wouldn’t be happening. “Akasha,” she replied. “What’s my father’s name?” she asked in return. When he heard that question, he looked at the woman waiting for a logical explanation to that question, since the child had never seen him before. The child looked up at the sun, seeming happier now, as if nothing else would have made her mother tell her what she wanted to know. “What’s happened all these years?” he asked. “Are you her godmother?” He pressed, trying to figure out where the child came from. “Because she recognized you,” the mother answered, hoping he would understand and change the subject. They were walking slowly until they reached the gate of a nice house near the square. She started looking for her keys, showing her intention to go inside while knowing that the little one wouldn’t let go of him. She let him come in. They watched her playing the delicate piano notes as they talked. The girl was actually playing lazily, so she could eavesdrop on them. “You never believed me, did you?” he asked. “A long time ago, you did care about what became of me. Now, don’t contradict yourself, I know you care about her too, and if you have ever trusted me, couldn’t you do it for a bit longer?” he pleaded, sitting by the little girl at the piano and reading from the music sheet along with her. The girl seemed to understand the notes without asking any questions, but he didn’t know how far she was into her piano lessons until he listened to the complicated opuses she could play by herself. In between the more difficult pieces, they played a simpler melody that her little hands could reach without distress or demanding speed. He stood up, ready to leave. Akasha looked at him, expecting him to stay, despite her resignation while facing the obvious outcome. “Why are you going?” she asked him, not really wanting to hear the answer. “Because if I don’t go, I can’t come back...” he says, expecting her not to understand. But she did. And she became her usual quiet self again. 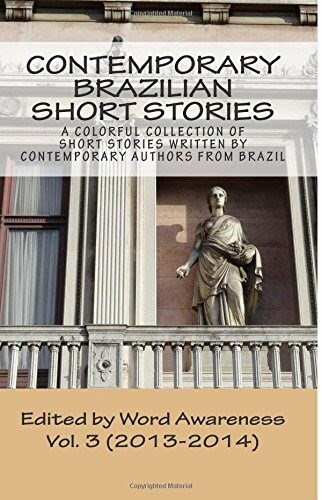 On her 20th birthday, she entered into her first book contract and Rosas& outros contos [Roses and Other Short Stories], written between 2003 and 2008, was published by Editora Biblioteca 24x7 in São Paulo. The limited first print edition was enough for her to benefit from the Cultural Incentive Law to reach wider distribution among Brazilian youngsters and make her work available through the public school system.